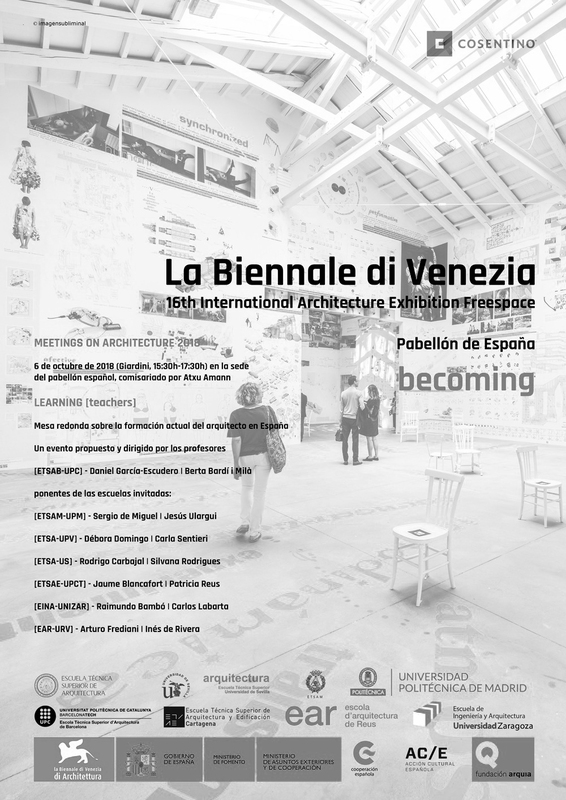 El 6 de Octubre de 2018 la Escuela Técnica Superior de Arquitectura participará en “Meetings on Architecture” durante la 16th International Architecture Exhibition Freespace, que tendrá Lugar en el Pabellón de España dentro de los Giardini della Biennale di Venezia. Meetings on Architecture is a programme of events that take place during the 16th International Architecture Exhibition from May to November in 2018. The programme is curated by Yvonne Farrell and Shelley McNamara and explores all aspects of their FREESPACE Manifesto. Meetings on Architecture is an opportunity to articulate diverse responses and interpretations of the Manifesto, while also providing a platform to hear from the many emerging and established voices presented in the Exhibition. The titles for the meetings are inspired by the text in the Manifesto and the ambition is for the audience to engage in lively provocative discussions about essential topics of our time, all framed around the concept of FREESPACE.